Mobile law enforcement solution with iBolo (TM) from At-Scene and FbF® mobileOne from Fulcrum Biometrics enables fast collection and sharing of “Be On the Lookout” (Bolo) data in the field using cost-effective, biometric-equipped mobile devices. These new mobile technologies make it easier for officers in the field to investigate crimes, fingerprint individuals, take photos, document GPS locations and create instant suspect bulletins. We used the FbF mobileOne iOS library to integrate our iBolo application with Fulcrum’s high-quality, mobile biometric hardware to create a solution that finally makes the prospect of mobile law enforcement possible. Fulcrum Biometrics, a leading international provider, distributor and integrator of biometric systems and devices, and At-Scene, a provider of mobile law enforcement applications, today announced that the iBoloTM law enforcement mobile application is now integrated with the FbF® mobileOne biometric fingerprint accessory to allow field collection of biometric data. The solution enables officers in the field to use smart phones and other mobile devices to quickly identify, categorize and track contacts, suspects and arrestees with a combination of photos, GPS locations, field notes and biometric fingerprint data. This information can be saved to databases on FIPS-compliant servers and can be used to create instant suspect bulletins for dissemination to other officers, departments or law enforcement agencies. Most biometric identification systems currently used by law enforcement officers in the field involve large, limited-purpose devices that can be cost-prohibitive to deploy across an entire force and are too cumbersome for use by officers working on foot, bicycles, horses or public transit. The FbF mobileOne fingerprint accessory is a sleek-fitting sleeve that easily snaps onto iOS-based mobile devices and can be used with iBolo running on the Apple iPhone or iPod touch to provide a low-cost, multi-purpose mobile law enforcement solution that is FIPS-compliant, yet easily fits into an officer’s pocket. “Truly mobile law enforcement technology has been a dream of cops in the field for many years,” said Mario Galasso, police Sergeant and CEO of At-Scene. “We used the FbF mobileOne iOS library to integrate our iBolo application with Fulcrum’s high-quality, mobile biometric hardware to create a solution that finally makes the prospect of mobile law enforcement possible. And because it uses widely available mobile technologies like the iPhone, the technology is easily accessible to even the smallest departments,” Galasso added. Photographs of contacts, distinctive markings, tattoos, etc. Data integration using Law Enforcement Technology Group’s FIPS-compliant servers, providing seamless integration with CAD and RMS systems. Together, iBolo and FbF mobileOne improve officer safety and productivity in the field, whether they are in cars, on foot, motorcycles, bicycles or public transportation. “At-Scene’s applications are designed by law enforcement officers for law enforcement officers, so we are pleased to partner with them in creating a complete mobile solution for use in the field,” said Ken Nosker, president of Fulcrum Biometrics. “When we released the FbF mobileOne fingerprint technology last year it was widely embraced by the law enforcement community and developers of law enforcement applications. iBolo is an excellent example of a field app that effectively helps officers quickly and easily gather biometric data and combine it with other essential information to aid in criminal investigations and the identification and apprehension of suspects,” Nosker added. In November 2011, FbF mobileOne was honored with two prestigious awards from the law enforcement community: the Cygnus Law Enforcement Group’s Innovation Award for Forensics and the “best in competition” Paramount Award given to the single product or service deemed the most innovative, new law enforcement product introduced in 2011. The awards were announced at the 118th International Association of Chiefs of Police (IACP) conference and exhibition in Chicago. FbF mobileOne biometric fingerprint accessory integration is available now with the iBolo application for the Apple iOS platform. iBolo is also available for Android. 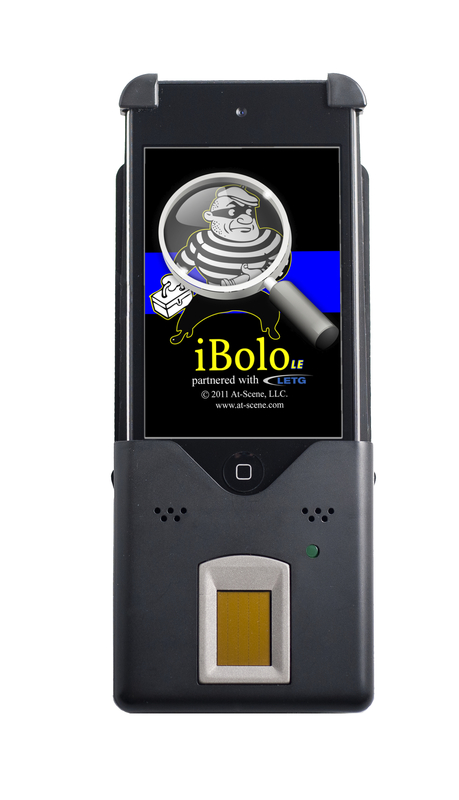 For more information on how to purchase iBolo and other At-Scene mobile law enforcement applications, go to: http://www.at-scene.com or call +1.952.210.8519. The FbF mobileOne biometric accessory for iOS devices is available now from Fulcrum Biometrics at http://www.fulcrumbiometrics.com and from authorized resellers. Developers and integrators can contact +1.210.348.3687 x110 to learn more about Fulcrum’s integrator/reseller program. At-Scene is a developer of mobile law enforcement applications for Apple iPhone/iPad and Android phones and tablets, forensic drug test kits and training solutions for law enforcement, security and military personnel. The company’s products include iCrimefighter-LE, a professional, mobile evidence-gathering solution; iCrimefighter-CV, a civilian version of the iCrimefighter solution for use by private detectives and other security personnel; iBolo for identification and reporting of contacts, suspects and arrestees in the field and iBeat Cop, a communications app that allows total mobility for foot beat, bike patrol and other assignments that are mobile in nature. The company is owned and operated by law enforcement officers. Founded in 2002, Fulcrum Biometrics is a leading provider, distributor and integrator of biometric identification technologies and devices for commercial, civil and military customers in more than 88 countries worldwide. Fulcrum’s offerings include industry-leading biometric software development tools, fingerprint scanners and other biometric sensors as well as custom software development for multiple platforms, custom integration and implementation of identity management applications and access control systems. Fulcrum is the developer of the Fulcrum Biometric Framework (FbF®), a rapid biometric application deployment suite which includes the FbF bioServer, FbF Silverlight Library, FbF Listener, FbF mobileOne and the FbF mobileOne iOS Library.